Made bishop of Seville in the year 600, he is supposed to have said, “Every bishop should be distinguished as much by his humility as by his authority”–and he certainly lived in humbling times. He filled the void of cultural and religious upheaval with words, for although he was essentially born into the life of a churchman concerned for his flock, it is as a scholar that he’s remembered. Reams of Latin, rather than miracles, define him. The Visigoths had arrived in the Iberian peninsula in the early fifth century, at the behest of the western Roman emperor Honorius, to make Spain safe from other barbarian tribes such as the Vandals, Alans and Suebi. As usually happens during such events, after lending their assistance, the Visigoths didn’t much feel like leaving. They were also adherents to the Arian form of Christianity, which–to summarize a subject that has exhausted entire libraries–claimed Jesus was subordinate and not equal to God the Father. The presence of these ruling Arians in largely Catholic Spain was always a problem, and one which Isidore spent much of his life trying to rectify. Arianism would not disappear completely from Iberia until long after Isidore’s death, but for those Visigoths who did convert and enter what might be called “polite society,” Isidore did what any politician might have done: he gave them a biblical pedigree, and claimed in his History of the Goths that they were descended from Noah’s grandson, Magog. He also sought to do away with a staple of the Visigothic Arian church that divided the laity and the officiants with a screen, which quite literally made it impossible for non-officiants to see or hear what was happening during mass. Whether in reforming ritual or with his own dense scholarship, then, the goal remained the emergence of a less ignorant and more aware laity. Although he has been criticized for being a derivative writer, copies of his works are more numerous than any other medieval author, and much of what survives are better termed compendia. According to the latest edition of Butler’s Lives of the Saints, his most famous work, Etymologiae (The Etymologies or Origins), is nothing short of “an encyclopedia of the knowledge of his time, containing information on subjects such as grammar, rhetoric, mathematics, medicine, and history.” Not to mention religion. As if all of this was about to be forgotten, whatever knowledge Isidore thought worth saving was included there. It took him twenty-five years to complete, but it paid off. In later centuries, his summaries of classical authors were preferred to the original works themselves, the Etymologiae became one of the key textbooks of the middle ages, and writers like Chaucer and Petrarch both mention their debts to him. That it took the form of a somewhat haphazard encyclopedia, only reflects the pressures of the time under which it was collected and written. To put it another way: some seven centuries later, in exile from a civil war in Florence, Dante Alighieri was still comfortable enough to attempt a similar “book containing everything,” The Divine Comedy. But he was able to compose his encyclopedic work in poetry using the “vulgar” Italian tongue of everyday life, as opposed to Latin. Isidore had no such luxury, and Latin was his tool; had he written his work in some predecessor of Romance and Spanish, there would have been few who could read it. 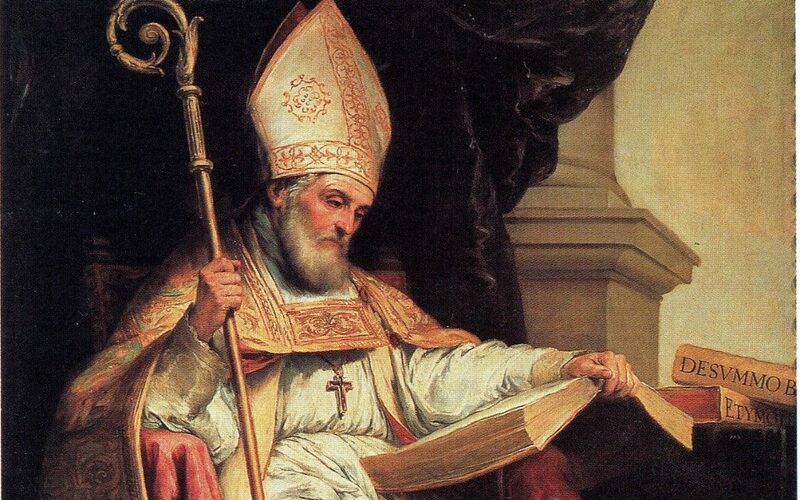 In a world where literacy was rare, it is understandable that Isidore put prayer and reading on an equal plane: “For when we pray,” he wrote, “it is we who talk to God, whereas when we read, it is God who speaks to us.” Books were everything. The historian Peter Ackroyd has called seventh and eighth century England “perhaps the most learned period in the nation’s history,” since it was during that time when the Venerable Bede lived, and which literacy and learning were again so scarce that a handful of people seemed capable of ingesting entire libraries, if only to make sure the knowledge they contained was not forgotten. A century before Bede, Isidore fulfilled this function in Spain. Following his death in 636, Isidore had a hit-or-miss afterlife. On the one hand, he was not made a Doctor of the Church until 1722, and his quiet and scholarly persistence was overshadowed in public affection by the more lurid accounts of Spanish martyrs who found it impossible to assimilate under later Muslim rule. On the other, when his remains were transferred to a new shrine in León in 1063, he gained in popularity since the new shrine was along the famous pilgrimage route to Compostela. And, in the fourteenth century, Dante placed him in Paradise alongside the Venerable Bede. His writings also spread to Britain and Ireland, and were known there less than twenty years after his death. As they often have throughout history, the Celtic and the Spanish likely intersected; further evidence is seen in the monastery of Bretoña, which was indeed founded by Britons during Isidore’s lifetime. Most recently, it’s been suggested that he be made patron saint of the internet, and of programmers. It is heartening, therefore, to imagine a writer from fourteen hundred years ago, compiling the knowledge of the known world in what must have felt like oppressive isolation, now keeping watch over every socially-awkward programmer, typing away in the glow of their laptops. And yet Isidore’s connection to the internet can go further: as mentioned, during the middle ages his Etymologiae was preferred to the actual classical authors themselves; nowadays, however, the originals have taken their place of primacy, and Isidore is mostly considered unreadable, or just unnecessary to read. This, for me, makes him alone many times over: isolated in his own time as one of the few human beings who knew, or even cared to know, as much as he did; isolated in trying to find a way to preserve it for a culture that would find it useful; and isolated in knowing that if Europe succeeded in climbing out of what we now called “the dark ages,” his work would no longer be necessary. As one commentator recently put it: “Isidore’s Etymologies, published in 20 books after his death, was an encyclopedia of all human knowledge, glossed with his own derivations of the technical terms relevant to the topic in hand. Derivations apart, it was lifted from sources almost entirely at second or third hand … none of it checked, and much of it unconditional eyewash – the internet, in other words, to a T.” And yet I still derive comfort from such a familiar mind, doing what he can, never having heard of Moore’s Law, but understanding it instinctively and continuing anyway, always worried the Visigoths might be at his door. Tim Miller's most recent book is Bone Antler Stone (The High Window Press) a collection of poems on spiritual and material life in ancient Europe. He writes about art, religion and history at wordandsilence.com.